Offering you a complete choice of products which include Kitchen Accessories such as Microwave Oven Wall Mount Stand, S.S. 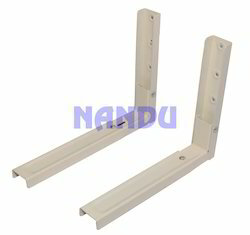 Kitchen Cabinet Clip Single Hole and S.S. Kitchen Cabinet Clip Double Hole. We are successfully ranked as the well-known manufacturer and supplier of an exclusive collection of S.S. Kitchen Cabinet Clip (Single Hole). It is used in the installation of kitchen cabinets. With the assistance of our state-of-the-art manufacturing facility, this product is fabricated using finest quality raw material and latest technology under the supervision of skilled professionals. Further, we offer this quality tested product to our precious clients in various specifications as per their requirements. Being a quality oriented firm, we are engaged in manufacturing and supplying the best quality Microwave Oven Wall Mount Stand. This product is utilized for keeping microwave. Our firm also caters to customize this product as per the customers’ requirements. The entire range is quality tested under the guidance of skilled quality controllers using advanced testing tools in order to eliminate flaws. Clients can avail this product from us at market leading prices. With the advantage of extensive prowess, we are involved in developing high in demand S.S. Kitchen Cabinet Clip Double Hole. We have gained rich expertise to design innovative clips for offering easiest options to attach a drawer front. It is a double hole clip used widely for kitchen drawers to reduce the noise of closings. We are procuring robust quality material to fabricate these clips which can be ordered from us at a nominal price.